Merle Wood & Associates is pleased to announce that the CENTIUM yacht sold this week in an in-house deal. Now named SILENTWORLD II, 12 guests are accommodated in 6 staterooms, including a main-deck master, a bridge-deck VIP suite, as well as 4 well-appointed double staterooms. Each has its own en suite facilities decked out in magnificent marble. Her full-beam master stateroom is bathed in warm, glossy cherry wood and a neutral-toned carpet. With a beam of 26’2” (8m) and a draft of 6’10” (2.10m), she is serviced by 8 crew. 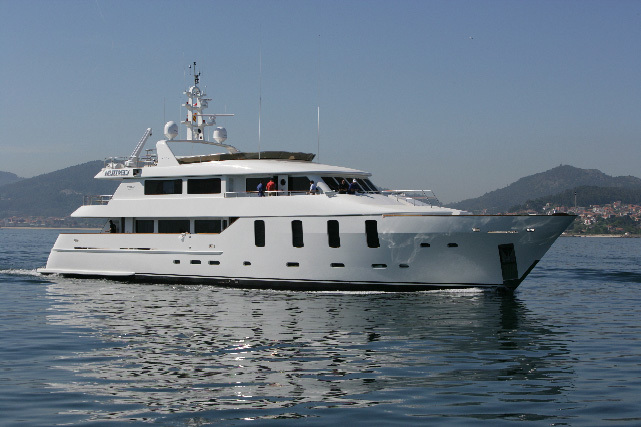 The CENTIUM yacht sold in part due to her comfort at sea, ample accommodations, and generous deck spaces. The CENTIUM yacht sold with a deep, cherry wood interior and neutral-toned soft furnishings with light blue highlights. Constructed with a steel hull and aluminum superstructure at Spanish shipyard Astilleros M Cies-Oassive, she was styled by yacht designer Inigo Echenique. As one of the largest yachts ever built in Spain, the CENTIUM yacht sold offering large deck spaces ideal for entertaining and relaxation. Her flybridge deck features copious seating around two dining tables that offer uninterrupted views in a casual setting. Further aft, a raised Jacuzzi with lounge chairs make it easy to relax. Al fresco dining aft is also enjoyed on the main deck, and is covered by a hardtop. Now Lloyd’s classed, she was built to commercial vessel standards, and is powered by twin Caterpillar engines, offering a cruising speed of 10 knots, a maximum speed of 12 knots, and a 4,000nm range. She is also equipped with zero-speed stabilizers offering maximum comfort for all aboard. We would like to thank the corresponding brokers who assisted in the marketing of this vessel. For more information on motor yachts for sale that are similar to motor yacht CENTIUM, please contact Merle Wood & Associates. With over 4 decades of experience as a luxury yacht broker, Merle Wood is likely the most successful of all his peers within the yachting industry. Running one of the premier yacht brokerage firms worldwide, he offers his vast expertise in the purchase, sale, construction and charter of luxury yachts for sale of all sizes and types up to 500 feet to discerning clients all over the world. For additional information, read the full CENTIUM yacht specs or view the CENTIUM yacht price and details. For information about the CENTIUM yacht, or for expert knowledge from a qualified yacht charter broker, simply contact the luxury yacht brokerage firm of Merle Wood & Associates for assistance.